The holidays not only bring parties, gifts, and cold weather, but they also bring family and friends from faraway places, which means that more than likely at some point, you’re going to have overnight guests. We are no exception. The Whiskey Wench’s brother, Chris, is in from San Francisco, and he was going to be staying here for a night. Chris passed the California Bar this past spring and was recently sworn in, so we now have a real lawyer in the family (don’t think that changes my general opinion of lawyers). Chris and I are fairly opposite types, but we get along; and for the most part find enough in common during our brief visits that we enjoy having to see each other. I picked Chris up at the airport (The Wench was still putting the house in order for her baby brother) and on the ride home I brought up whiskey (which I often do) as a subject to see if Chris — who will be known as Esquire from here forward — was a candidate to enter the circle. I normally don’t let folks into my whiskey circle unless I know they have a true appreciation for The Brown. After a few questions, he started to open up about enjoying Rye whiskey but had little to choose from in his collection. Just mentioning that you like Rye or any other whiskey normally wouldn’t be a pass into the circle, but Esquire is a good guy; and being family and a lawyer (you never know when you need one), he was granted a temporary pass. I thought this would be a great opportunity to do a review on some of my Ryes and get a relative newcomer’s opinion on a variety of them. His circle status would be up for review at the end of the tasting. 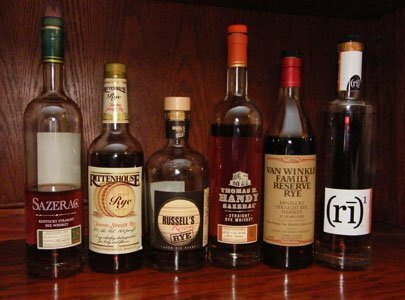 I have heard some folks describe Rye as a brother or sister to Bourbon, and for those who really enjoy and know Rye, they know it is more of a distant cousin. The similarities between the two are only that they are made from a grain and sit in a barrel for a period of time (like a lot of spirits). The flavor profiles are completely different with Rye being very distinctive with its spicy dryness. Only in the last few years have I started to fully appreciate Rye whiskey and consider it among some of the finer whiskeys available. Rye hasn’t been popular for decades, but in the last 5 years has found a rebirth with the surge in fine spirit consumption across the country. The good news is that distilleries are working hard to get more and more good Ryes to the market place. 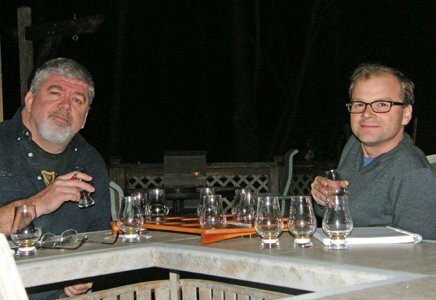 After having braised lamb shanks for dinner (which I made and were most excellent), Esquire and I retired to the deck by a roaring fire and gave the Whiskey Wench a list of 6 Rye whiskeys to pour for us to taste. They ranged in price from $14 to $78. As usual, the Wench brought them to us blind so we weren’t influenced by the price or brand while rating them. I will say that we both found something good about them all: three did rise to the surface as great whiskeys; two we considered as good; and the last is a great whiskey for cocktails, but fell short on a good neat whiskey. This was our least favorite of the bunch. I guess you do get what you pay for sometimes. The nose was fairly flat and not much in terms of body when it came to flavor. It did have a warm spiciness to it on the end that gave us little something to speak of. At the end of the day, I would not recommend this for a neat whiskey, but it does make a great Manhattan. See the Whiskey Wench Manhattan article. What: This is from the makers of Wild Turkey, and we both considered it a good whiskey. It has a citrus nose on it that comes across as spicy. Once it hits you, it is Rye whiskey through and through. It has a wonderful long, warm, peppery finish. In my opinion, this is a whiskey that is just a year or two more in the barrel from being great. It’s a recommended whiskey, and it’s hard to find a $30 whiskey nowadays that is this enjoyable neat. What: This is relative newcomer to the market, and I bought it based on an article I read a couple of years ago. The nose was a bit thin, and the flavors were in-line with its nose. It does have the basic characteristic of a classic Rye, but the flavors weren’t as developed as I would like. This certainly isn’t a great whiskey, but it does fall in the “good” category and is worth owning if you want to have a diverse collection. I would consider this a light Rye. What:This might possibly be the best Rye on the market at any price. Jim Murray, the noted whiskey writer, has called it “whiskey of the year.” This is a full-flavored and very smooth whiskey that defines what a good Rye should be. It’s spicy, a bit dry, and leaves a very long oily finish that makes you want more of the same. Esquire, with his limited exposure to whiskey, noted this was the best of the group for him; and I certainly agree. Not only was this the best of the group, but also one of my personal top five whiskeys. This is a hard bottle to find — if you run across one, buy it!!!! What: This, you might say, is the big brother to Sazerac. It’s from the same distillery and is part of the antique whiskeys from Buffalo Trace, as is the Sazerac. It is a big whiskey with a lot of flavor and depth, but the alcohol comes through and masks the flavors a bit. Even with this minor flaw, we still consider this a great whiskey with all the classic character that you expect in a Rye. It’s a great after-dinner sit-by-the-fire-on-a-cold-night whiskey. A good cigar would be a treat with this Rye. What: If you read the “Family Reunion” article, you know how I feel about anything that has the Van Winkle name on it. This Rye is no exception; it’s a great Rye that makes you appreciate the folks that take the extra time to hand-craft whiskey. It’s a perfect balance of wood and spice which gives it character and makes it a great whiskey. This whiskey falls short of Sazerac and Thomas Handy on the nose but catches up to them with flavor. It certainly isn’t as bold as Sazerac and Thomas handy, but has a more refined quality that makes it a bit unique for Rye but a hallmark of what the Van Winkles do to whiskey. This is a great whiskey by anyone’s standard I would guess, and a great buy at less than $50. After all is said and done, if you haven’t had a Rye, you might be pleasantly surprised on how good they are. If you do like Rye whiskey, maybe one of these will be your next purchase. I think Esquire has gained some knowledge and proved to be a good sport and tasting partner, and seemed to thoroughly appreciate all that was offered. While he might not have made full circle rights yet, his pass has been upgraded to permanent visitor…….